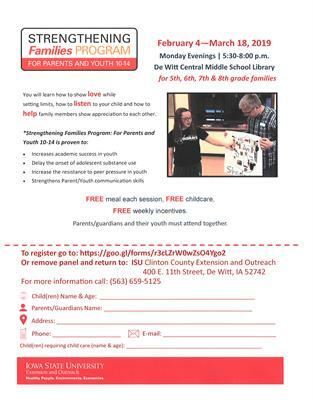 Strengthening Families Program: For Parents and Youth 10-14 is being offered in Clinton County to all families with youth ages 10-14, delivered by Iowa State University Extension and Outreach Youth and Families Specialists on Monday evenings February 4 through March 11 at the DeWitt Central Middle School Library. Free meals and incentives will be given to participants at each program! 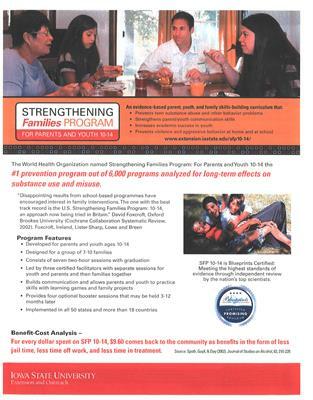 FREE Program including education, FREE meals and FREE incentives for participating!